When I moved in June to Philadelphia, I did have a few things on my must-do-first list, and highlighted on that list was to finally have an espresso with Philly’s own Christina Pirello. We met on a rainy day at the Italian market in Christina’s favorite coffee shop, Anthony’s, and we talked and talked like old friends. I asked Christina to be the September guest blogger for my Fabulous Women in Vegan Food series and am very happy she agreed. Read and learn about this dynamic redhead, find her new recipe for Back Di Dama, which are one of my favorite Italian cookies and scroll to enter the giveaway for one of Christina’s cookbooks. 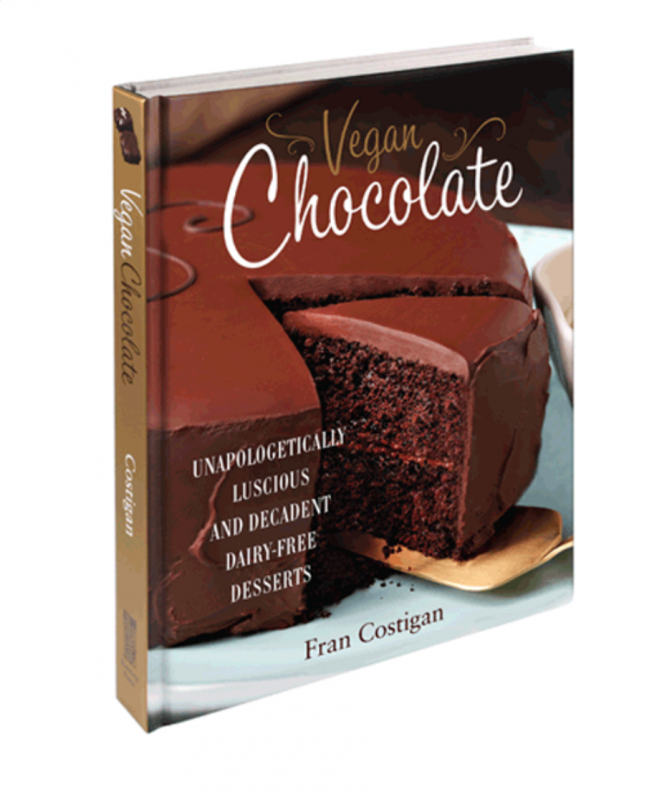 Thanks to the lovely and talented Fran Costigan for asking me to guest post. We have been in each other’s orbit for more than 25 years and just met face to face a few weeks ago. It was a treat I can’t describe after all the years of just missing each other at events, conferences and get-togethers. I love this “new-old” friendship with this amazing woman. As a child, some of my most vivid memories are of the Friday night and Saturday morning treks to the farmers’ markets in our area of New Jersey. My mother would pile us in the car and head off to find the best vegetables and fruit she could manage. She baked all our bread and sweets, working outside the home as well as in it. She loved to cook and to nourish. She loved to make dessert; all of my aunts loved to make dessert and constantly debated who ruled in the treat department. My mother’s commitment to fresh ingredients was matched by an insatiable thirst for knowledge about alternative health. While she and I cooked, continuing right on through dinner, she would talk to me about the latest article she had read about health and food. So I guess you could say both dessert and healthy cooking are built into my DNA. After studying art in college and working in Italy for a year after that, I have always moved between food and art in my work and in my life. And I loved, loved, loved making sweet treats, both professionally as a pastry chef and at home. Loved it. I love cooking too, but baking rules my heart. 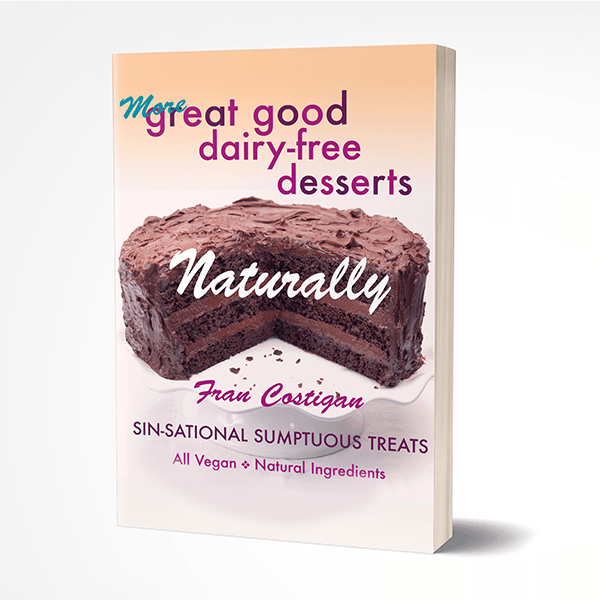 And so when I adopted my current vegan-macrobiotic lifestyle, I had to come up with satisfying, decadent-tasting desserts that would keep me happy but not compromise my health (or anyone else’s…). 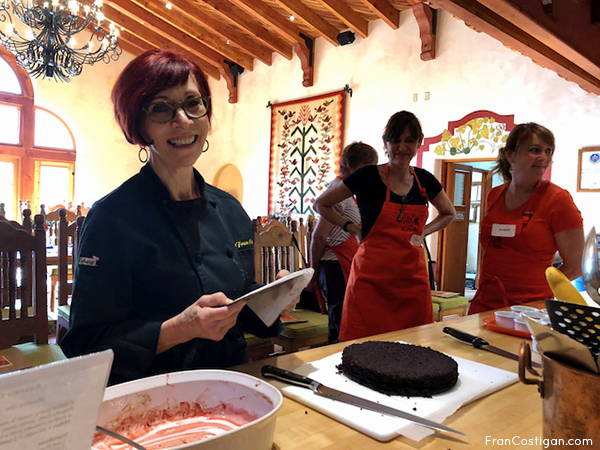 Many years of baking later, I am contentedly working as a cooking teacher, world traveler hosting groups of tourists in Italy and baking…always baking…at home and for my wee baking business. Perfecting a vegan version of a dessert, especially classics, is so much fun for me…which is how this sweet treat was born. I received a cookie baking book in the post and fell in love with its gorgeousness. But then again, baking cookies is truly my ‘thing.’ They’re friendly, cozy, easy to make, yummy and just enough of a treat as to not land heavy on our hips (unless you eat the whole tray, but that’s on you, my loves). Here is my newest creation. I fell in love with the name of this obscure but classic Italian cookie and after making them vegan, I fell in love with the actual cookies, too. These are tiny, bite-sized treasures. You pop one or two with an espresso for an amazing treat. They look fancy, like they should be for special occasions only, but when you see how easy they are to make…well, all bets are off! These crisp on the outside, tender on the inside sandwich cookies are each just one bite of richness with deep rich chocolate in the center. And just like ladies’ kisses, they’ll leave you wanting more. Preheat oven to 350oF and position the oven racks in the middle and lower middle of the oven. Line two rimmed baking sheets with parchment. Cream the cold vegan butter with vanilla, coconut sugar and sea salt until smooth in a stand mixer. Add arrowroot, baking soda almond/hazelnut meal and flour. Mix until a soft dough forms. Do not over-mix. Turn the dough onto a dry work surface and create a soft ball. Cut the dough into 4 equal pieces. Roll each piece into a rope about 10 inches long and about ¾-inch thick. Cut the rope into ¾-inch pieces. Roll each piece into a ball and arrange on baking sheet about an inch apart. Repeat with balance of dough. You should have between 72 and 80 small balls of dough on the baking sheets. Bake for 16 minutes, rotating the racks halfway through baking, at 8 minutes. The cookies should be a wee bit soft to the touch. Transfer the cookies to cooling racks and cool completely. When the cookies are cooled, make the chocolate filling. Melt chocolate and rice syrup in a heat-resistant bowl over simmering water (make sure the bowl doesn’t touch the water), whisking often until the chocolate is creamy smooth and shiny. Transfer bowl to a dry towel on your work surface. Pairing cookies of similar size, spoon ¼-teaspoon of filling on the flat side of a cookie and gently press the flat site of the other cookie into the chocolate, creating a tiny “sandwich.” Repeat with all cookies and chocolate. COOK’S TIP: If the chocolate thickens while you are working, simply loosen it over simmering water for a few seconds and continue. COOK’S TIP: I use rimmed cookie sheets for this recipe as I want the cookies to be tender inside and I have found that rimless “cookie” sheets result in a hard cookie. CHRISTINA PIRELLO is the Emmy award winning host of the national public television series, “Christina Cooks.” The author of 7 cookbooks including the bestselling “Cooking the Whole Foods Way,” Christina was a pioneer of the natural cooking movement, hosting the first vegan cooking program on national television. In her view, there should be only vegan cooking shows, but until that time, she is happy to create them (along with her pals like The Jazzy Vegetarian). 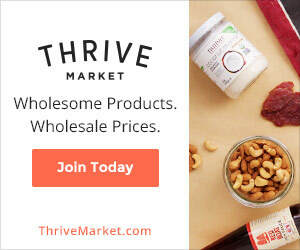 You can find recipes, information on Christina’s cooking classes and wellness vacations in Italy and other very cool stuff at christinacooks.com. Christina has an autographed copy of her book Cooking The Whole Foods Way for one lucky winner. Follow the instructions below to enter. U.S. residents only, please. Contest ends at midnight eastern time on September 19th. Good luck! I think my favorite Italian vegan dish is risotto! So creamy and yummy. Do you have a favorite risotto? My favorite? It is a toss up between lasagna and pizza. That is tough. I agree, love them both! I remember watching Christina’s show when I first became a vegan. So great to have her cooking guidance. Thank you! Not sure of my favorite Italian dish but ever since discovering Panelle I’ve enjoyed it– no veganizing required. Panelle is easy and delicious and as you said, no veganizing required! Polenta! I like to serve it with veggies on top. I love polenta, with veggies on top like you and also cut and grilled. Haved you ever tried polenta for dessert with Fruit and syrup on top? I love all Italian food. Let’s stick with the obvious – pasta! Robiin, you had me at Italian food! That is for sure!!!! I watched Christina Cooks before I “cut the cable” – well before I went WFPB. The recipe concepts and methods were intriguing and enlightening. Primavara — always a popular choice! I have loved watching Christina for years! I first learned about whole wheat pastry flour from her back in the 90s! We like everything Italian! My son even took a year of college Italian so he could study abroad in Florence. I have some of Christina’s marinated eggplant in my fridge now. Oh, Florence. Two years ago wnen I visited, it had become a vegan mecca. I wrote a blog about it. Ummmm Marinated Eggplant! I love all vegan Italian foods. I mean, pizza is genius. But polenta, allowed to cool, cut into squares and layered like lasagne with sauce, sautéed mushrooms and maybe some vegan cheese and baked–pure comfort food! Polenta is my comfort food too! So do I! What veggies do you like best?